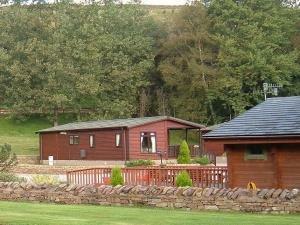 Augill Beck Park Holiday ParkThe holiday lodges and caravans provide accommodation of an excellent standard being tastefully furnished, comfortable and well equipped. Set against a rolling backdrop of fells bordering both the spectacular Lake District and Yorkshire Dales National Parks, Augill Beck Park is the ideal location for the perfect holiday. Augill Beck Park offers weekly bookings starting on Saturday and sometimes short breaks. Double room with en suite, family bathroom, twin bedded with 2 x 6ft x 3ft beds. Holly's Lodge offers weekly bookings starting on Saturday and sometimes short breaks. Double room with en suite access, twin bedded with 2 x 6ft x 3ft beds. The Elms offers weekly bookings starting on Saturday and sometimes short breaks. From Brough follow A66 trunk road east, after just 1 mile turn left then immediately turn right. Follow the lane to the end where the park entrance and reception can be found. From the east, follow A66 towards Brough. Turn right where signs direct to Augill Beck Park. Turn right again, follow lane to park entrance.